This Fresh Amla Thokku Pickle is a versatile pickle with a lot of interesting usages. It can be had with any South Indian tiffin items like Idly, Dosa, Upma and Rice preparations and also with North Indian Rice preparations and Breads. It is excellent for a spicy Tartine; spread it on a toast or a French Baguette; use it in any sandwich or Burger and use like a sauce or chutney to go with any world cuisine. 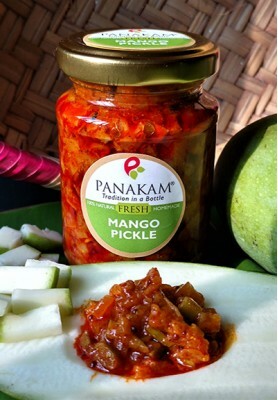 A healthy and nutritious fresh Pickle as an accompaniment for various dishes! 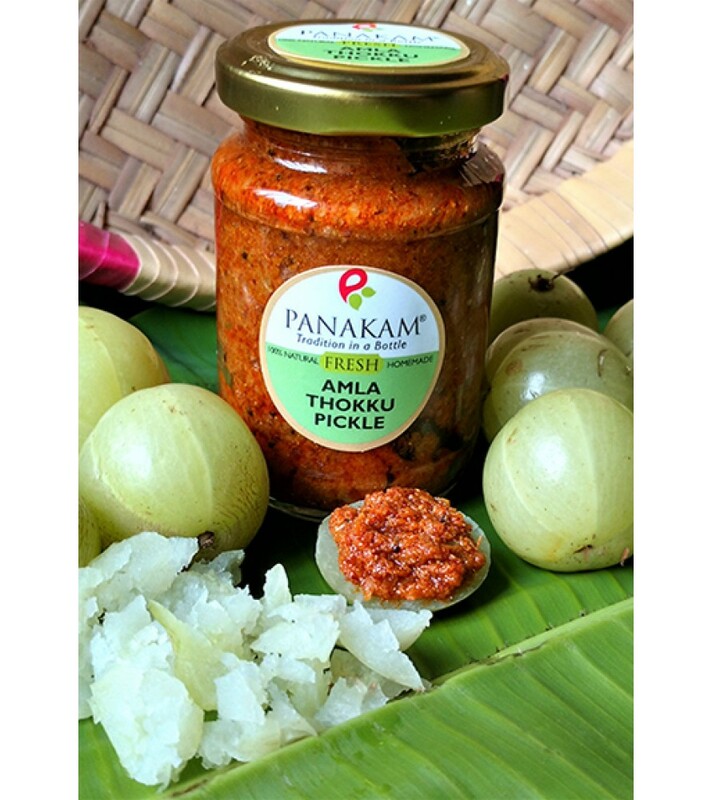 This Amla Thokku Pickle will be available between the months of September and March. Please check with us for availability during the other months. Amla Thokku Pickle is a spicy and tangy pickle made with grated Amla (Gooseberry). Freshly made by mixing grated Amla with fine spices, oil and other ingredients, it is a versatile accompaniment to many South Indian and North Indian preparations. It can also be used for a spicy tartine and a tangy spread for breads and sandwiches. 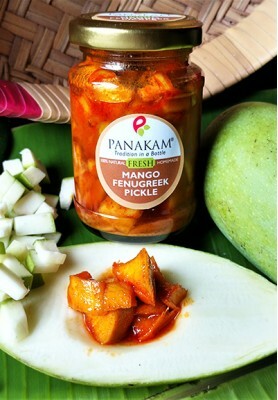 This Pickle is part of the Seasonal Fresh Pickle offerings from Panakam-Tradition in a Bottle. Indian gooseberry is a common ingredient in many Ayurvedic preparations. Rich in Vitamin C, polyphenols and ellagitannins, all parts of the gooseberry plant are used in various Ayurvedic, Siddha and Unani medicines. Gooseberry, which has five out of the six tastes recognized by Ayurveda, increases immunity, enhances digestion, and cools the body. Finely grated Gooseberry (Amla), Cold Pressed Gingelly Oil, Fenugreek, Jaggery, Red Chilly, Lime juice,Turmeric, Asafoetida, Salt and Condiments. 6 months from the date of packaging under ideal storage conditions.